Gavin Brown's parents were Alexandria D Duncanson and Frank B D Brown. He was born in Lundin Links, a small town on the south coast of Fife in Scotland. He attended Madras College in St Andrews where he was taught mathematics by John Macdonald. I [EFR] attended Madras College at the same time as Gavin, being a couple of years behind him, and was also taught by John Macdonald, or "Dr Jock" as he was affectionately known by the pupils. Gavin was Dux of Madras College in 1959, his final year at the school and, after sitting the Bursary Examination of the University of St Andrews, was awarded a Harkness Scholarship (the most prestigious of the University of St Andrews entrance scholarships). He entered straight into the second year mathematics class and graduated in 1963 with First Class Honours in Mathematics and Applied Mathematics. He was awarded the Duncan Medal, again the more prestigious award to a graduating student. A semi-algebra in a Banach algebra B is a subset A of B such that x + y, αx and x.y belong to A whenever x and y are in A, and α ≥ 0 is real number. ... awarded to a member of the Society under the age of 40 years for distinguished research in the mathematical sciences. A significant portion of the research work should have been carried out in Australia. After being Head of the Department of Pure Mathematics and then Head of the School of Mathematics, Brown became Dean of the Faculty of Science of the University of New South Wales in 1989. He spent two years in England during his time on the staff at New South Wales, namely 1979 when he was Visiting Professor at the University of York and 1986 when he was Visiting Professor at the University of Cambridge. 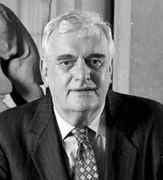 Features of Professor Brown's period as Vice-Chancellor included a major restructuring of University management, a strong focus on links with industry and a programmed return of the University's budget to surplus. Professor Brown was also very active in national and regional committees during his time at the University. The most notable of these was his service as Chair of the National Advisory Group on Science and Technology Awareness and Promotion. On 1 July 1996 Brown became Vice-Chancellor and Principal of the University of Sydney, a post which he continues to occupy. Given the tasks involved with his positions at the University of Adelaide and the University of Sydney it is remarkable that he has been able to continue his mathematical research and research collaborations at a very high level. For example during his ten-year period in Sydney, from 1996 to 2005, Brown published around 30 papers. To give an idea of the topics he now works on we give the titles of the four papers he published in 2004: The maximal Riesz, Fejér, and Cesàro operators on real Hardy spaces; Lebesgue measure of sum sets - the basic result for coin-tossing; The maximal Fejér operator on real Hardy spaces; and Approximation on two-point homogeneous spaces. In addition to the honours we have mentioned above, Brown has received honorary degrees from the University of St Andrews (1997) and the University of Dundee (2004). In January 2006 Brown was appointed an Officer of the Order of Australia. Gavin Brown married Diane Ranck in 2004, his first wife Barbara Routh having died in 2001. He has one son and one daughter by his first marriage.